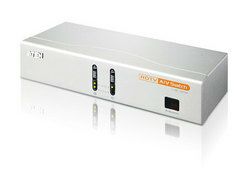 Component Video | Simply Connect Pte Ltd. The 2 port VS231 makes plugging and unplugging devices a thing of the past. This high quality component video (YPbPr) switche with on-board stereo audio is perfect for HDTV enthusiasts who want to add more inputs to their high-definition display.